A Dutch political movement is calling for the legalization of the psychoactive drug Ecstasy – and has opened a shop in Amsterdam to promote its cause. The youth wing of the Dutch Liberal Democrats says decriminalizing MDMA would make drug-taking safer. The Young Democrats opened the shop Monday at 10 Rosmarijnsteed, in downtown Amsterdam – but just for one day. So far, the initiative is just from the party’s youth wing, as the main Dutch Liberal Democrats (also called D66) has not so far gotten behind the legalization drive. "There's 40,000 people who use ecstasy on a monthly basis, so that's quite a lot, and they all buy it on the black market, from illegal street dealers, and you have no idea what is in an ecstasy pill, how much MDMA is in there, that's the working substance in ecstasy, even sometimes there is poisoned ecstasy which is sold. Last October, three people died of poisoned ecstasy. You should stop with criminalising it and start legalising it and that's what we're showing here behind me," Dirkjan Tijs, President of the Young Democrats, told Ruptly. Sadly for the party people, the shop still has to respect the law, so it’ll be handing out placebos, not real MDMA pills. The Young Democrats say their initiative is inspired by a broad range of issues. "We can prevent minors from buying, make sure there is no overdose [due to] pills and educate people on ways to minimize the risks involved with ecstasy usage,” the Young Democrats’ website says. The group says the law should be changed to prevent partygoers dying from tainted Ecstasy pills, citing in particular one case of seven deaths in 2014. The most common causes of Ecstasy-related deaths include the pills not being MDMA at all, overdoses of the drug, or a dangerous mix with other substances that mimic the effects of euphoria, but are not meant for ingestion. 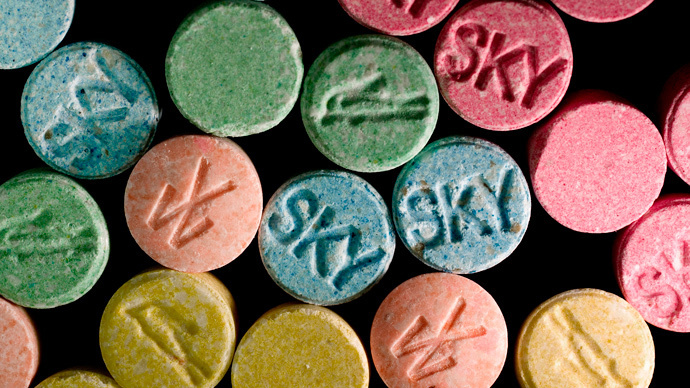 The Young Democrats’ proposal has led to a petition calling for legalizing Ecstasy, called MDMJA (combining the name of the active ingredient in Ecstasy with “Ja,” the Dutch word for 'yes'). It has already attracted some 40,000 signatures. Estimates say around a half million Dutch people have tried ecstasy or some form of MDMA derivative at least once in their lives. Both the sale and possession of MDMA are currently illegal in the Netherlands.